We have something pretty damn interesting to share with our readers today. 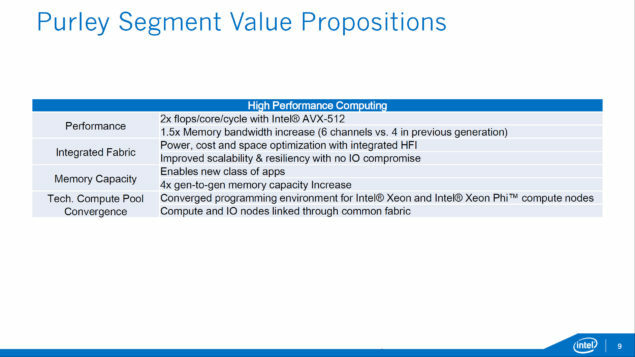 Below is the slide deck that talks about Intel’s upcoming Xeon Skylake Platform: Purley. 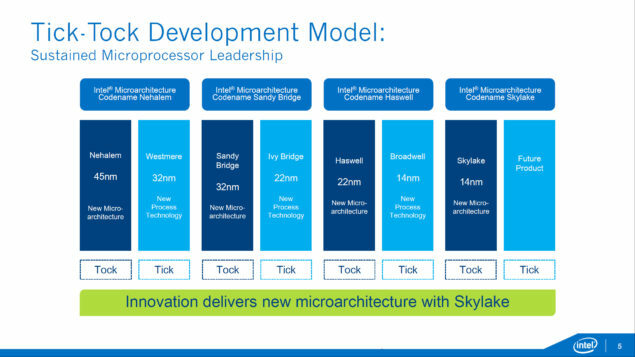 It also confirms something we hinted upon a long time ago, that Skylake uArch isn’t just another Haswell – albeit on the non-mainstream side of things. 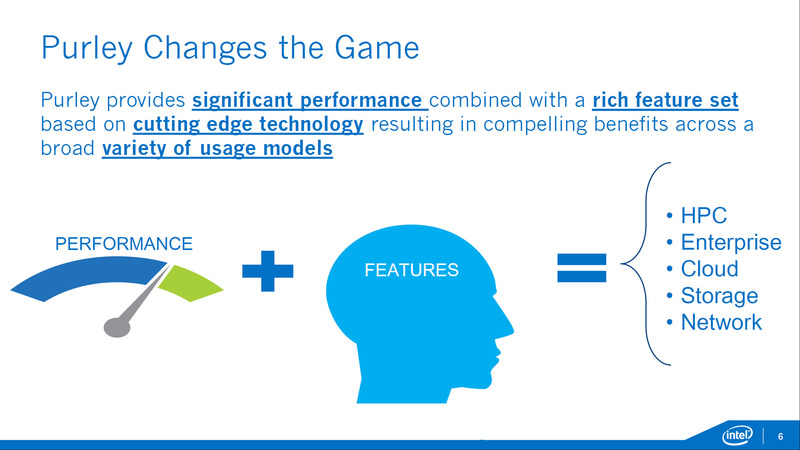 The Xeon E5 and Xeon E7 will be getting some pretty interesting updates soon. 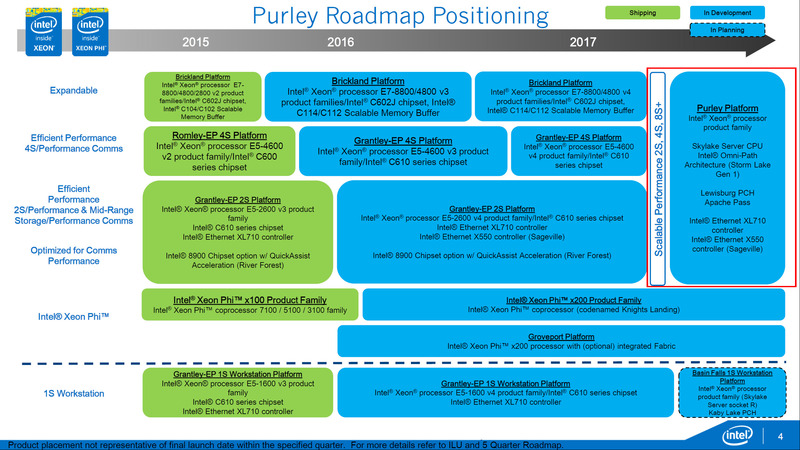 Skylake Purley is poised to be the biggest update since the age old Nehalem platform. Along with the improved performance per watt that comes with every article iteration, Skylake EX Purley will actually ship with 6 Channels of DDR4 as opposed to 4. It will also include the AVX 512 instruction set and will boast the 100G OmniPath interconnect. Skylake Purley will also have Cannonlake graphics support not to mention FPGA integration (another important upgrade). The FPGA will be able to execute programmable logic as opposed to the Skylake processor. Okay, lets talk a bit about platforms. The slide above details everything about the Purley platform for Skylake Xeon E5 and Xeon E7. 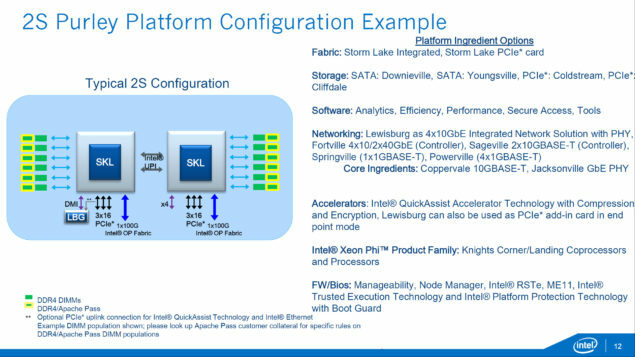 One of the biggest advancements that Skylake will have is the Intel Omnipath Architecture integration which will be called Storm Lake (Generation 1). The PCH will be codenamed Lewisburg while as it will also ship with updated Ethernet controllers. 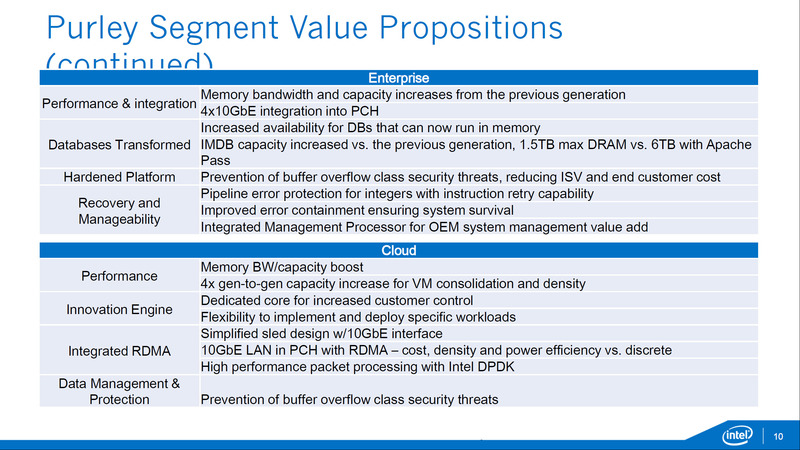 Another very important point to note is that the platform will be scalable up to 8 Sockets – which is frankly an absolutely insane amount for CPUs working in tandem in any given configuration. Specific SKUs have not been disclosed at this time. 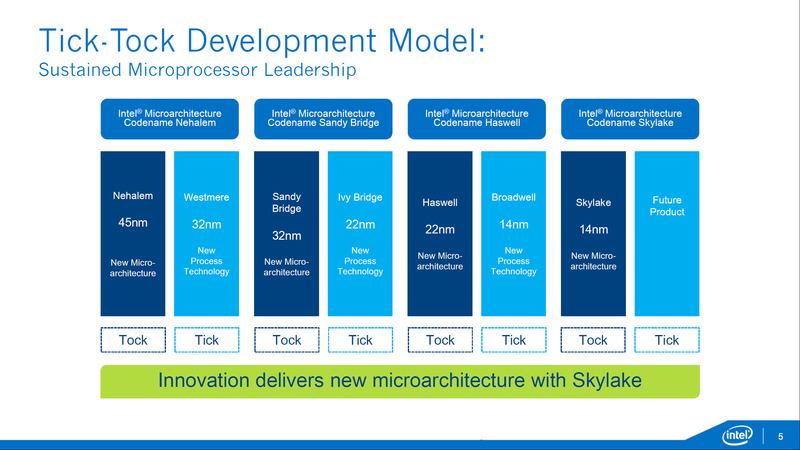 Skylake EX Purley will be spread out amongst the entire scalable segment – unlike the previous iterations. The TDP will be configurable from 45W to 165W and will require Socket P. Another interesting point to note is the fact that not only will Purley update the number of PCIe slots to 48 but they will finally be configurable in x4, x8 and x16 divisions ( a major update). Broadwell will be split into two categories depending on the target market (and the scalability required). 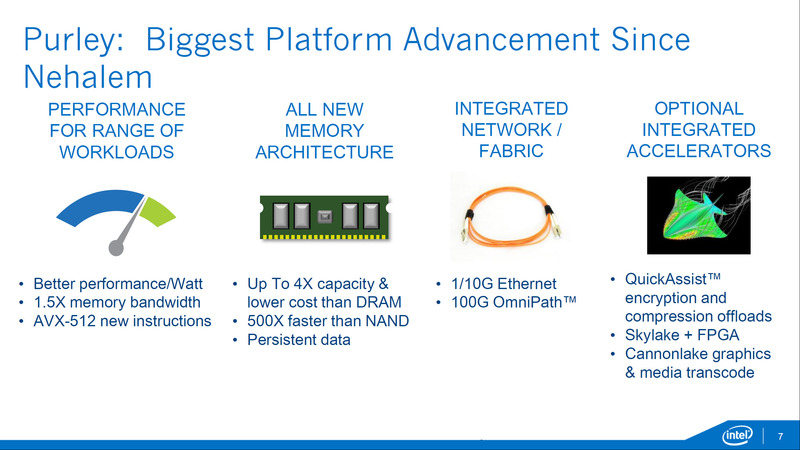 There is the Brickland platform for the Broadwell side of things on the high end scalable segment. The SKU families E7 8800/4800 V3 and E7 8800/4800 V4 are specified in a succeeding order. The 4S segment also contains the Grantley- EP 4S platform which once again has two iterations, one planned for 2015 and the other for 2016. The SKU family 4600 v3 and 4600 V4 has been specified. At the 2S segment of the market is the Grantley Platform. The SKU family reported here is the Xeon E5 2600v4. Brickland with Bridewell-EX CPU will have 115 to 165W TDP and will utilize the Socket R1. 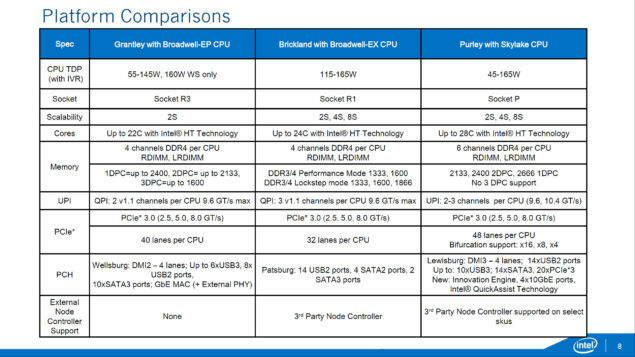 The usual 4 Channels of DDR4 will compliment the setup and 32 lanes of PCIe (per CPU). Grantley with Braodwell-EP will have configurable TDP of 55-145W and a separate 165W setup. Their will be the usual 4 Channels of DDR4 memory and 40 lanes of PCIe.